I am pleased that so many of you have attended today’s meeting, supporting those brethren who have received Provincial Honours and Promotions, including of course my new Deputy Provincial Grand Master and new Assistant Provincial Grand Master. Worshipful Brother Roger Cargeeg has already given considerable service to the Province for a number of years, both as our Provincial Grand Director of Ceremonies and then as an Assistant Provincial Grand Master. Worshipful Brother David Leaity has also been a stalwart member of the Province and despite travelling regularly all over the world in his work, has always given a strong commitment to Freemasonry and in particular as our Provincial Charity Steward. Both have also been honoured by promotions in Grand Rank and on the 24th of April, at the Investiture Meeting in London, Roger will become a Very Worshipful Brother when he is promoted to Past Grand Sword Bearer and David will be promoted to Past Senior Grand Deacon. I am also delighted that my Assistant Provincial Grand Master, David Maskell, will be promoted to the active rank of Senior Grand Deacon and my other Assistant Provincial Grand Master, Martin Winchester, to Past Senior Grand Deacon. In addition to this, our Past Provincial Grand Secretary, Alan Odgers will be promoted to Past Junior Grand Deacon. We also have two first appointments to Grand Rank and I am equally delighted that John Chandler, the Provincial Year Book editor and Steven Franklin, our Charity Assistant, are both to be invested as Past Grand Standard Bearers. Both have given a great deal of their time in serving the Province behind the scenes. The changes at today’s meeting have arisen from the retirement of my Deputy Provincial Grand Master for the last four years, Very Worshipful Brother Peter Roberts. Peter has given unstinting service to this Province and given me great support through some challenging times. Following his promotion from an Assistant Provincial Grand Master, he soon learnt that there was more to being a Deputy Provincial Grand Master than just wearing a different apron and chain and looking pretty. Some say that he struggled somewhat with the latter! Brethren one of the most important aspects of our annual meeting is to recognise the commitment given to Freemasonry by the brethren of our Province. Today I have been pleased to present my Certificates of Service to Freemasonry to four brethren who have given tremendous service to their Lodges and to the Province. I have been equally pleased to invest all of those brethren who have received their first Provincial appointments and those receiving promotions. Once again, I must stress that I hope that this will be a spur to further endeavours, to ensure the continued success of their Lodges and of the Province. We are lucky in our organisation to have such a wide range of skills, all of which are needed to ensure that we function effectively. With regard to the active Provincial Team of 2018, I have already thanked those who have been reappointed today for their continuing hard work and support. To those have completed a one-year appointment, your support and enthusiasm is much appreciated by me, my Deputy and Assistants, at the many installations and other official occasions that you have attended. One of the active Provincial Officers retiring today, is Bob Deacon who has been our Provincial Deputy Grand Director of Ceremonies for the last three years. Bob really has ben a tremendous asset to my team and whether on duty or not, he has always been there when needed. Make the most of it Bob, as your next role as an active Provincial Warden in the Mark starts in just five weeks! Brethren, 2018 was very different from the 2017 Tercentenary Year, but a year in which further initiatives were introduced by the Improvement Delivery Group to continue the Strategic Plan. One of the most important of these is the Members Pathway, which was formally launched in our Province last October, to assist Lodges in attracting, recruiting and retaining members. Since then the Provincial Membership Officer and his team have been giving presentations at Lodges, to assist them with the implementation of the different steps. Fundamentally, the key issue is that every Lodge should be undertaking a complete appraisal of themselves and formulating a planned strategy for their continued survival. If Lodges do not grasp this idea, then they cannot expect to meet the expectations of modern men, both from the point of view of attraction or retention. The number of initiations in 2018 was disappointingly low and this, coupled with deaths and resignations, has resulted in a reduction in overall membership. Whilst I am encouraged by the number of younger new members and their enthusiasm, we must make a determined and focussed effort to redress the decline. To this end, I am pleased to report that my plans for a University Scheme Lodge are well advanced. The Lodge of the Chisel, which was originally set up with an educational theme, has agreed to covert to a University Scheme Lodge, meeting at Falmouth. A number of brethren with connections to education have already become joining members, with a view to taking the Lodge forward as the semi-permanent officers, accepting the probable transient nature of the future initiates. Interestingly, there are those who feel that the transient nature of university students will not be of benefit to our Province. Personally, I think that they miss the point in that we will be contributing to the overall membership of Freemasonry and at the same time as giving a positive role for the Lodge of the Chisel. Introducing young, enthusiastic and capable members to a Lodge can only be of benefit to our Province and I do not see a downside. A University Scheme Lodge operates in a markedly different way to other Lodges, but still retains the same basic Masonic principles and ceremonies. The age of the target membership is considerably lower than our existing Lodges and the meeting time, day and agenda content will be tailored to the younger undergraduates. It will not therefore pose any challenge to existing Lodges. Another positive idea from the Improvement Delivery Group is the launch of Solomon. This is a project that our Provincial Orator, Mike Murton, has been directly involved in and the result is an extensive online repository containing a wealth of Masonic articles and information. This can be accessed by any member, either as an individual for his own researches into Freemasonry, or on behalf a Lodge to obtain one of the many presentations available for use at Lodge meetings. The stimulation of further interest and understanding of our order can only be of benefit to us all. In addition to the foregoing, following his presentation at the December Quarterly Communication of Grand Lodge, the Grand Secretary, Dr David Staples, has set up a review of all processes by which UGLE operates, under the name of Project Hermes. His aspirations are to modernise these processes, eliminating paper, repetition and delays, by rewriting them to meet the needs of a 21stcentury organisation and make life easier for Lodge Secretaries and Provinces. 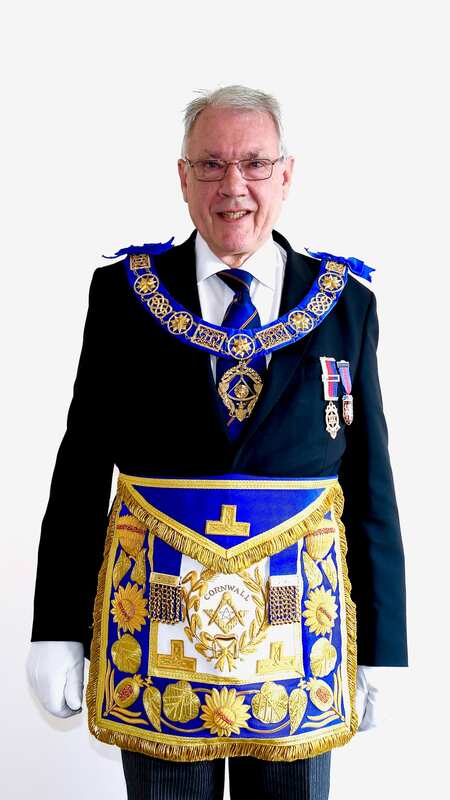 Amongst these changes, he wants to remove the need for Annual and Installation Returns and improve the way in which monies are collected from members by UGLE. A project within our Province has been the total rewrite of our Provincial Website and this new site was launched in January. It is a considerable improvement, with clarity and ease of use, which is accessible to all and a showcase for the Province. I must thank our Provincial Communications Officer, Phillip Lakin, and his website team for the many hours work they put in over a twelve-month period to achieve this new site. Brethren, two weeks ago today saw the start of a very major undertaking in our Province and that was the launch of our 2024 Festival in aid of the Masonic Charitable Foundation. The formal launch was held at the Royal Cornwall Showground Pavilion, where almost 150 representatives from our Lodges attended a dinner prior to the presentation. We were delighted to have the President of the Masonic Charitable Foundation, Right Worshipful Brother Richard Hone in attendance, together with Worshipful Brother Paul Crockett, a full-time Fundraising Support Officer with the charity, who has been assigned to our Province. They both spoke after the dinner and gave us a detailed insight into the nature of a Masonic Festival and gave us many valuable pointers as to how to make a modern Festival a success. I have to say that the reference to sponsored underwater cycling is still exercising my imagination. We as a Province now have the next five and a half years to show the Masonic Charitable Foundation how good we are at raising monies for charity. The extent of this will depend on your innovation and your imagination for fund raising activities, particularly if this can be combined with enjoyment and the involvement of your families. The Festival Director, Vyvyian Jenkins and his team are looking at various Provincial fundraising events and merchandising ideas, as well as the grand finale in late 2024. There are five Festival Area Representatives, each of whom have been assigned responsibility for a number of Lodges and their role is to give advice and be of assistance to those Lodges throughout the Festival. Most importantly, individual donations will be paramount and I ask that each and every one of you considers his ability to make a commitment, over the period of the Festival, of at least the amount to achieve a Stewards Jewel, which is a minimum of £300. A number of you have picked up your Festival jewels today and you will see the design of the jewel depicted on the banner behind me. A prerequisite to gaining approval for the jewel from Grand Lodge. was that our emblem had to be registered with the College of Arms. Unfortunately, we could not use the traditional Cornish shield with the fifteen bezants, as this is part of the Duchy of Cornwall’s arms. Hence this new unique design, which belongs exclusively to the Province of Cornwall in perpetuity. I must thank Restormel Lodge No: 856 for very generously, funding the cost of the banner. I would also like to give my sincere thanks to Worshipful Brother David (DMS) Williams for his outstanding workmanship, in creating the new banner stand and holder. There are various ways in which donations can be made to the Festival and Gift Aid will make a very considerable difference to the end result. Wherever possible therefore, please make use of Gift Aid to ensure a further 25% is added by H M Revenue and Customs to your personal donations. The use of the Relief Chest system will also considerably streamline the transmission of your donations to the Masonic Charitable Foundation, where all monies will earn a very favourable rate of interest. Brethren, as I have said on a number of occasions, we face many challenges, but please do not be disheartened; see these as an incentive to spur us on to ensure the future of our Province and Freemasonry as a whole. We are all volunteers and we must not lose sight of our main objective, which is to enjoy our Freemasonry. I do hope that you have enjoyed our meeting this afternoon and it only remains for me wish you, your families and all of the Lodges in the Province a very happy year ahead and to say to you all have a safe journey home!